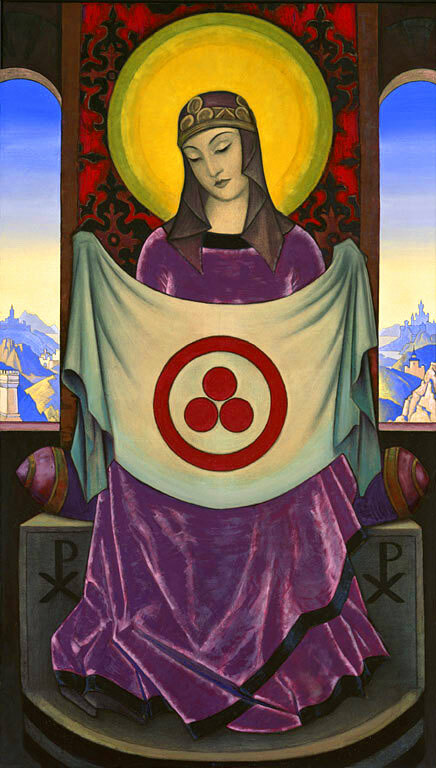 Nicholas Roerich was a visionary. He was also a painter, a set designer, an archaeologist and mystic but to confine him exclusively to any one of these categories would be unfortunate, for he was a man who reached beyond his capabilities in everything he endeavoured. 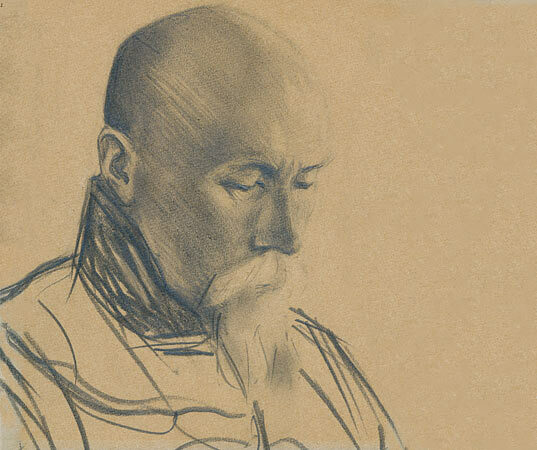 Nicholas Roerich was born in St. Petersburg, Russia in 1874 to an upper middle class family. 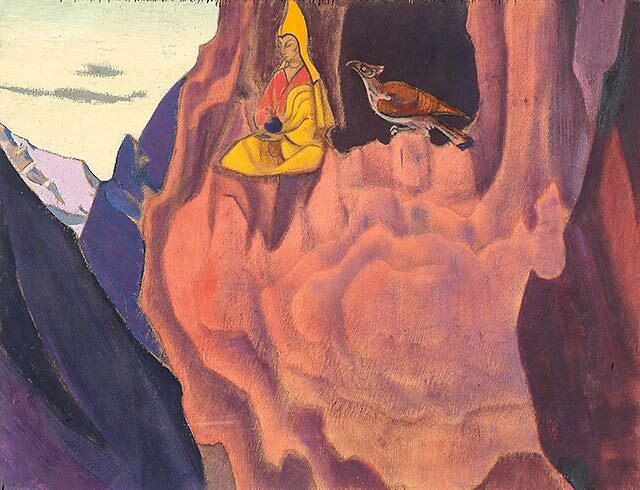 Roerich did not waste time expressing his advanced and mature talents. Before the age of ten, he was already embarking on his lifelong interest in archaeology, collecting prehistoric artifacts, coins and minerals. He built his own arboretum for the study of plants and trees and he showed an early aptitude for painting. While studying at the Academy of Art, he met Mussorgsky, Stravinsky and Rimsky-Korsakov and it wasn’t long before he was designing sets for the theatre. He established himself alongside the young Sergei Diaghilev, founding the short lived but influential magazine, The World of Art. He married Mussorgsky’s niece, Helena Shaposhnikov, and together they set out to discover the world, settling in the Himalayas from which Roerich has left us 7,000 paintings. The biography of Nicholas and Helena Roerich and their two children is extensive and if the reader is interested in learning more about this powerhouse of a family I would suggest visiting the websites of the Roerich Museums in New York and St. Petersburg for detailed information. Also, Heart of Asia: Memoirs from the Himalayas is a book written by Roerich on his travels and tales from this region. As for Sichów House and Library, the central theme and ethos of our project is largely inspired by what is known as the Roerich Pact, a treaty signed on April 15, 1935 in Washington D.C. by the members of the Pan American Union. It was Roerich’s vision for humanity and he symbolised this treaty with a flag he called the Banner of Peace. He wrote: Let us be united—you will ask in what way? You will agree with me: in the easiest way, to create a common and sincere language. Perhaps in Beauty and Knowledge. One can hardly imagine that the horror of World War Two was about to grip Europe only four years after this treaty was signed, and which essentially asked that during times of war the cultural and religious buildings be protected. Countries and their respective wars have come a long way since this pristine request was set forth in the damage to not only ancient sites and religious and cultural buildings, but now to hospitals and schools where the elderly and the children are the vulnerable targets. In literally a world gone mad, Sichów House and Library wishes to protect what is possible to protect: poetry, art, music, dance, freedom of religious choice, philosophy, science, medicine and depth psychology by means of encouraging people in these particular fields of experience to gather here amidst the quiet and serene nature of the woodland park. We are surrounded by beauty and we welcome your knowledge to complete what we hope will serve to influence the future of humanity. Remembering Beauty. Remembering Aesthetics. (We thank the Nicholas Roerich Museum for providing the background information in this description).